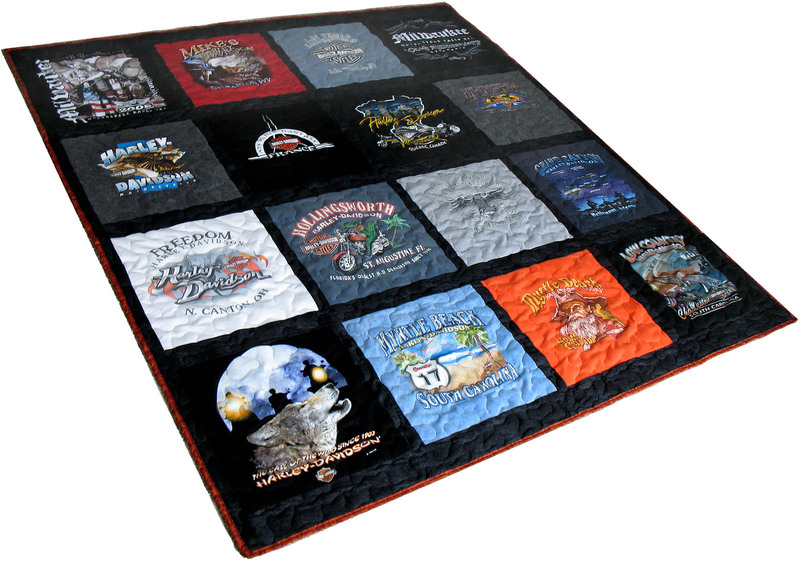 A Couch Potato T-Shirt quilt contains 12 shirt panels. 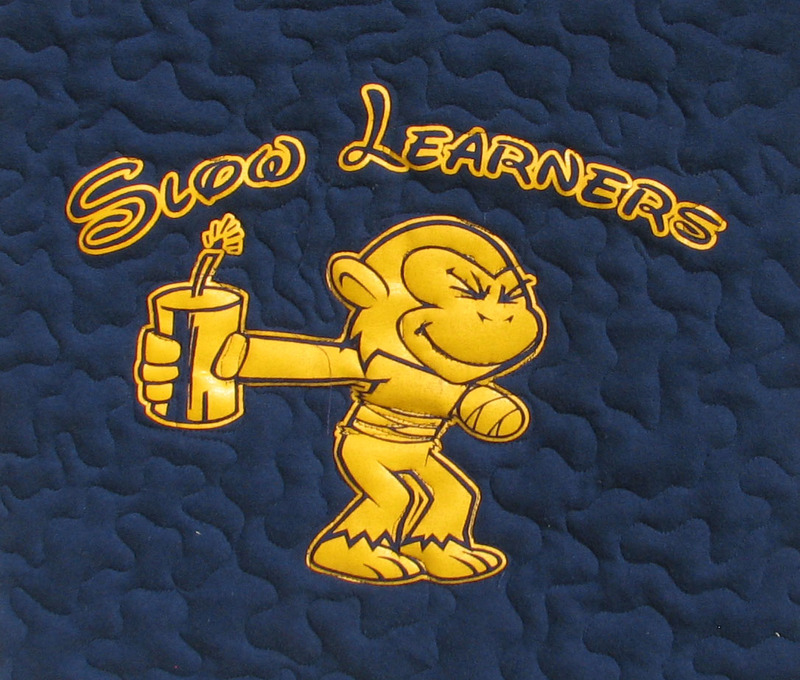 The T-Shirt Panel is the primary focus of a memory quilt. The panels are harvested from the customer’s shirts. The typical size for a shirt panel square is 15 inches. This can vary due to the size of the shirt and the size of the shirt graphics. Both the front and the back of the shirt can be used if desired. It creates a non-stretching fabric which allows the quilt to be manufactured at a higher quality due to it’s now stable nature. From a stack of shirts… to a beautiful quilt! The Backing is a cotton or cotton blend fabric that makes up the backside of Mary’s quilts. It is a solid, one piece panel (with exception to the King sized quilt) in a color which is selected by the customer (see a list of available colors below). Any color can be selected to create an accent or to follow a theme such as your favorite team or school colors. If a specific color is desired, simply send a sample color or mark a shirt that contains the color and Mary will try to match the shade as closely as possible. For example, if your school colors are dark yellow and blue, select yellow during checkout for the backing color, mark a shirt that contains the color or send a sample and Mary will do her best to match it. If you are unsure of what color to select and you want Mary to use her best judgment, an option called ‘Let Mary decide’ is available. All Mary’s Quilted Memories quilts come standard with sashing! Sashing is a key component of a Mary’s Quilted Memories quilt. 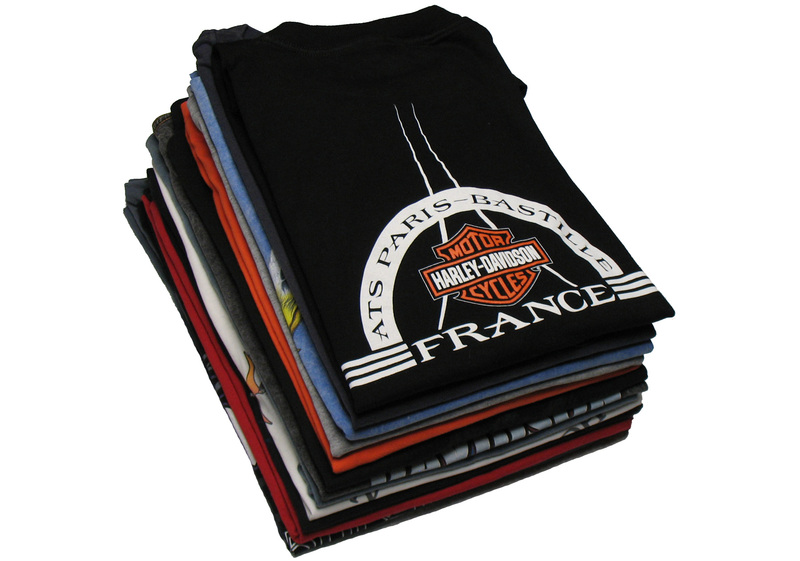 Sashing is the fabric that borders, frames, and distinguishes the T-Shirt panels. It creates the front color of your quilt and provides separation between the shirt panels. It enables integration of color themes (team, product or school colors) into your quilt and creates separation between different color shirt panels. Mary provides an option to select a subtle printed sashing. If this option is selected, Mary will search for and select a subtly printed fabric in the color selected to further enhance the quilt's appearance. If you're unsure of what color sashing to use and you want Mary to use her best judgment, Select the "Let Mary decide" option during checkout. The Quilt Stitching is the machine sewn thread pattern that binds the quilt backing to the front T-Shirt panel over the entire quilt. The stitching also secures the interior batting in place. This creates the quilts texture, feel, durability, and most importantly, it’s what makes a quilt a quilt. 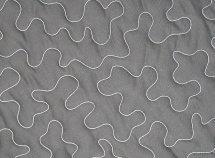 Mary provides two stitching options (Meander and Loop Meander) with an "Outlined" option. "Outlining" is an option to stitch around the shirt panel graphics to make them stand out. It is great to highlight smaller graphics but is not recommended for large graphics. 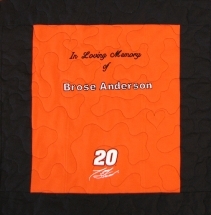 Embroidery customization is a great way to personalize or individualize your keepsake. From a personal sentiment, to dating a special event or achievement, most any message or statement can be added to one of Mary’s products. 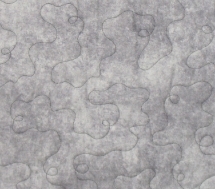 On a Panel – This method adds the embroidery directly to any shirt panel, a blank shirt panel, or a separate fabric panel. (as seen in orange below). Appliqué – This method applies the embroidery to the project through the application of an appliqué (as seen in red below). Due to the quilting process, embroidery can only be added to the front side of Mary’s quilts. To order, simply select the Embroidery option during checkout. Mary will then contact you to arrange the details of your desired embroidery. 1. Wash your shirts – Please wash your T-Shirts with detergent only. Do not use fabric softener! Fabric softener will compromise the adhesion of the interfacing to your shirts. If fabric softener is discovered, we will need to wash the shirts to remove it and an additional fee may be incurred. 2.Mark your shirts - Once your order is placed, you will receive an email that contains a printable layout form. This form will illustrate to us how you want your shirts arranged on your quilt. You will need to securely mark your shirts with the corresponding numbers form the form with either masking tape or a pinned label or paper. Please do not pre-cut your shirts! 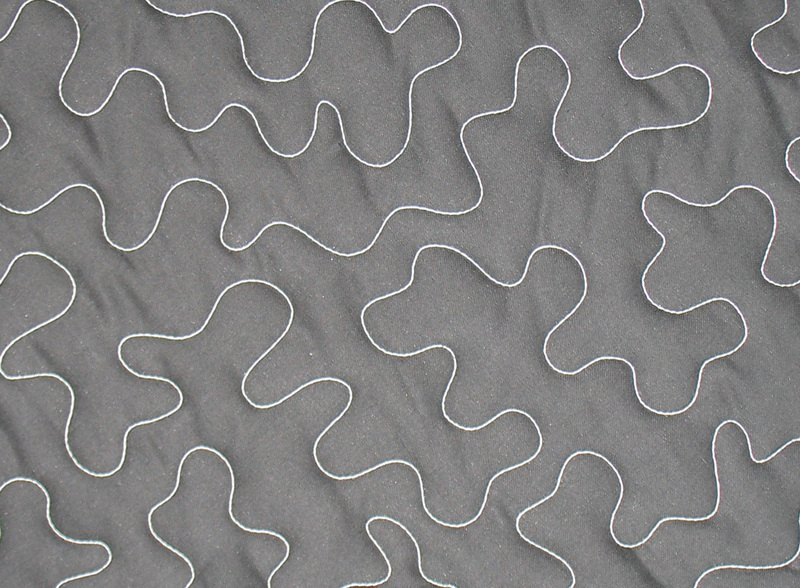 Getting a good, square panel is important to the quality of your quilt and this cannot be accomplished unless the interfacing is applied prior to the final cutting of the shirt panel square. Thank you for taking the time to prepare your shirts for processing. We look forward to turning them into a keepsake! 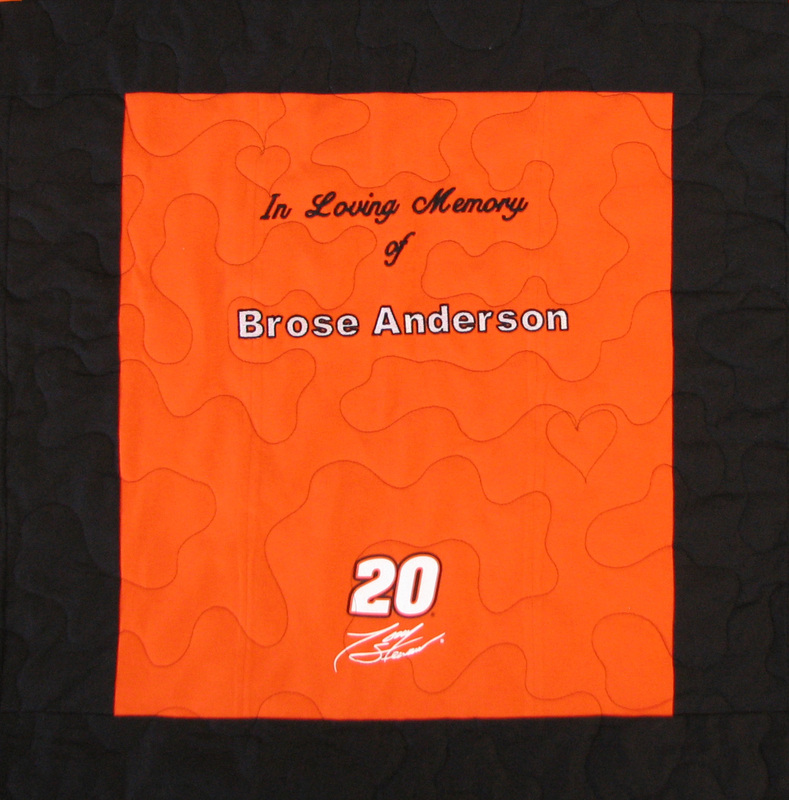 Select each option below to customize and create your own one of a kind quilt. Embroidery Instructions. If you selected embroidery as an option, please include specific instructions as well as the exact text content below. All options above must be selected to proceed.